Zhengzhou Batte domestic large-scale measuring gear pump R&D and production units, provide metering gear pump models of the smallest 1cc, the largest 3200 cc, can meet most of the extrusion production line production needs. What are the highlights of Bart's new metering gear pump used in extruder production line? The following will explain. Batte's new metering gear pump mainly consists of three parts: power drive, fluid transmission and regulation control. It is driven by click to realize medium transmission. By adjusting and controlling the speed of motor, the flow rate of metering gear pump can be controlled in a certain range. 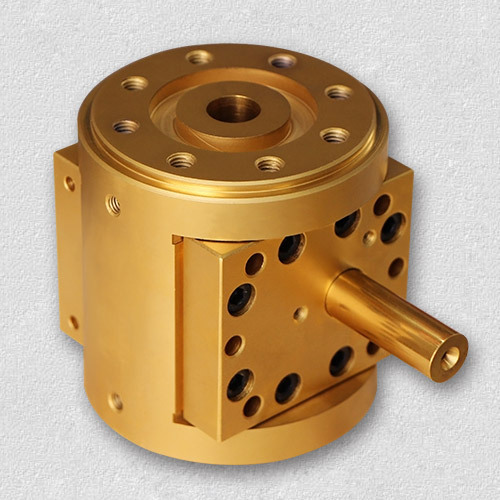 Metrological gear pump is used in extrusion production line and extruder matching: 1. It is conducive to stable melt delivery in extruder production line, and the fluctuation of melt pressure is reduced. 2. The use of metering gear pump is beneficial to increase the production capacity of extruder production line, because the material reflux can be reduced in the process of pressure transmission from screw of extruder to gear metering pump; gear metering pump can easily establish the pressure needed by die, so as to reduce the back pressure of extruder and improve its delivery. Delivery capability. 3. Facilitating the decrease of temperature, the decrease of back pressure of extruder will reduce the residence time of medium in the machine and make the plasticizing process more stable.